In the articles entitled Dumbing Down Society Part I: Foods, Beverages and Meds and Irrational Consumerism (or The Few Companies Who Feed the World), we looked at the many reasons why processed foods should be avoided. Not only does consuming fresh, local foods a strong political move (more productive than occupying anything in my opinion), it is more importantly the best thing you can do for your body and your brain. 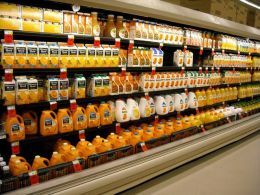 Consumer Reports published this week a study revealing that toxic levels of arsenic are found in popular brand fruit juices. An old saying says “for each rat you see, there are 50 you missed” (or something of the sorts). This also probably applies to processed foods. Each time a poisonous substance is found in a food product, there are probably 50 that are not even known or mentioned. So, why not avoiding that crap? Fresh pressed juice is so much better anyway. Arsenic in your juice. How much is too much? Federal limits don’t exist. Our findings have prompted Consumers Union, the advocacy arm of Consumer Reports, to urge the FDA to set arsenic and lead standards for apple and grape juice. Our scientists believe that juice should at least meet the 5 ppb lead limit for bottled water. They recommend an even lower arsenic limit for juice: 3 ppb. Case in point: From 1958 through 1970, residents of Antofagasta, Chile, wereexposed to naturally occurring arsenic in drinking water (PDF) that peaked at almost 1,000 ppb before an arsenic removal plant was installed. Studies led by researchers at the University of California at Berkeley found that people born during that period who had probable exposure in the womb and during early childhood had a lung-cancer death rate six times higher than those in their age group elsewhere in Chile. Their rate of death in their 30s and 40s from another form of lung disease was almost 50 times higher than for people without that arsenic exposure. Evidence of arsenic’s ability to cause cancer and other life-threatening illnesses has surged because some of the diseases linked to it have latency periods of several decades. Only recently have scientists been able to more fully measure the effects in populations that were exposed to elevated levels of arsenic in drinking water many years ago. The Environmental Protection Agency periodically revises its assessment of the toxicity of various chemicals to offer guidance on drinking-water standards. Based on such a review, the agency changed the water standard for arsenic to 10 ppb, effective in 2006, from the 50-ppb limit it set in 1975. The EPA had proposed a 5-ppb limit in 2000, so the current limit is a compromise that came only after years of haggling over the costs of removing arsenic. Since 2006, New Jersey has had a 5-ppb threshold, advising residents that water with arsenic levels above that shouldn’t be used for drinking or cooking. For known human carcinogens such as inorganic arsenic, the EPA assumes there’s actually no “safe” level of exposure, so it normally sets exposure limits that include a margin of safety to ideally allow for only one additional case of cancer in a million people, or at worst, no more than one in 10,000. For water with 10 ppb of arsenic, the excess cancer risk is one in 500. Debate over that standard is likely to begin anew. The agency’s latest draft report, from February 2010, proposes that the number used to calculate the cancer risk posed by ingesting inorganic arsenic be increased 17-fold to reflect arsenic’s role in causing bladder and lung cancer. The proposal “suggests that arsenic’s carcinogenic properties have been underestimated for a long time and that the federal drinking-water standard is underprotective based on current science,” says Keeve Nachman, the Johns Hopkins scientist. Each year the FDA tests a variety of foods and beverages for arsenic and other contaminants. It also started a program in 2005 to test for specific toxins such as arsenic and lead in domestic and imported products. As of late November, that program had published results for 160 samples of apple juice and concentrate. And the agency can alert inspectors at U.S. ports to conduct increased surveillance for products suspected to pose risks. Currently there’s an alert for increased surveillance of apple concentrate from China and six other countries “where we have a suspicion there may be high levels of arsenic in their products,” says FDA spokeswoman Stephanie Yao. But in fiscal 2010, the agency conducted physical inspections of only 2 percent of imported food shipments. For more about the FDA’s tests, read our update and download a PDF of our complete test results. Consumers Union urges federal officials to set a standard for total arsenic in apple and grape juice. Our research suggests that the standard should be 3 ppb. Concerning lead, juice should at least meet the bottled-water standard of 5 ppb. Such standards would better protect children, who are most vulnerable to the effects of arsenic and lead. And they’re achievable levels: 41 percent of the samples we tested met both thresholds. Too many children drink too much juice, according to our poll of parents. One in four toddlers 2 and younger and 45 percent of children ages 3 to 5 drink 7 or more ounces of juice a day. The American Academy of Pediatrics cautions that to help prevent obesity and tooth decay, children younger than 6 should drink no more than 6 ounces a day, about the size of a juice box. (Infants younger than 6 months shouldn’t drink any.) The possible presence of arsenic or lead in juices is all the more reason to stick with those nutrition-based limits. Our findings are from 555 telephone interviews in October with parents, who were asked about children’s juice consumption the previous day. Totals don’t equal 100 percent because some said they didn’t know how much juice their kids drank. Orange or red symbols on the map indicate areas where samples contained arsenic at levels exceeding the federal limit of 10 micrograms per liter, or 10 parts per billion (ppb) for public drinking water. • The appearance of the arsenic distribution is influenced by the order in which wells are plotted. In this map, wells with higher concentrations are drawn on top of those with more moderate concentrations. This overplotting may exaggerate the frequency of high values in areas where wells are close together. But given the risks posed by arsenic exposure, we opted in favor of making areas with elevated arsenic visible whenever possible to encourage private well owners in those areas to test and treat their water to reduce exposure risks. • Arsenic concentration may vary with depth within the same aquifer, or between aquifers that are stacked vertically—for example, a shallow sand and gravel aquifer can overlie a deeper bedrock aquifer. The map does not show the vertical distribution of arsenic. With these qualifications in mind, the data above provides an estimate of arsenic occurrence in the groundwater resource in general. Visit the USGS for additional information on the studies behind the map, along with more detailed maps for various portions of the country.